The other day we were talking with an organization about their OKR (Objective and Key Results) program. As the conversation unfolded the client’s conversation began going in loops. Eventually it dawned on me that the organization was unclear about how OKRs are born, grown, harvested, re-grown, etc. The seed – the trunk of the tree – is the organization’s strategy. 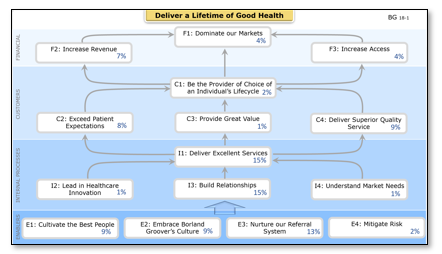 We generally capture the organization’s strategy through a strategy map – a cause-and-effect diagram that shows the relationship between the strategic objectives and their relative priorities. Using the Strategy Map that the Executive team built, the OKR team, our arborist, will graft each Strategic Objective onto the trunk. Each Strategic Objective becomes a branch coming from the trunk – representing the corporate level Objectives. The tree can have as many branches as you’d like – but less than 15 is a good rule-of-thumb. Each Corporate Objective branches into ‘sub-objectives’ that come from departments, processes, projects, teams, etc. 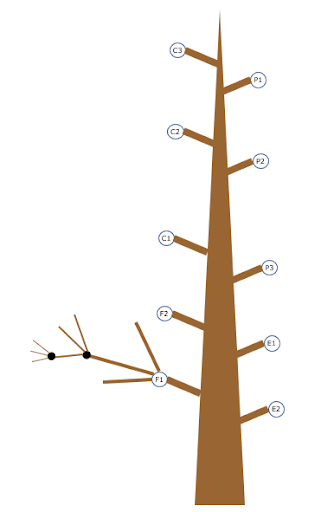 Each subsequent branch is smaller in scope (size). This branch network shows the primary parent-child relationship between Objectives as they cascade into the depths of the organization. If you start at the branch tips, you can trace back up the branch network to the Strategic Objective that gave birth to them. If you start at the trunk, you can see all the sub-objectives they have grown from that original branch. 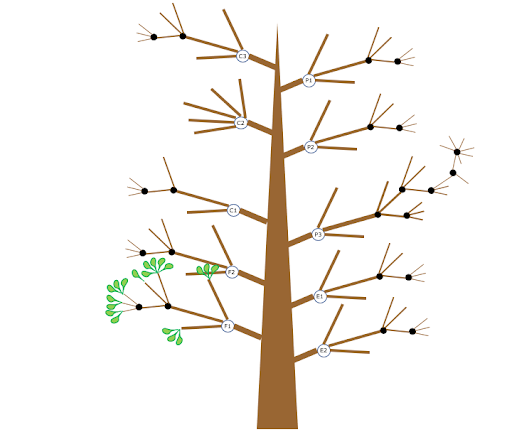 Off of each branch (Objective) are leaves (Key Results). Each Key Result (KR) represents S.M.A.R.T. measures that indicate progress towards their branch – or Objective. 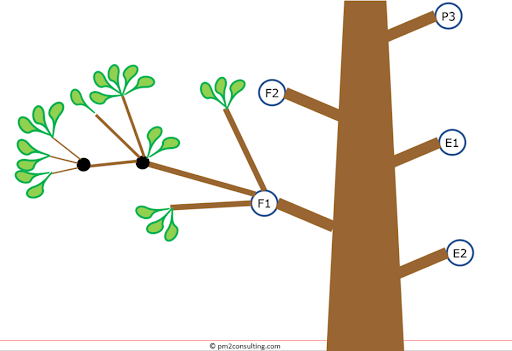 Any Objective can have both Key Results (leaves) and other Objectives branching off of it. In this way you can directly measure how that Objective is doing, as well as seeing the things contributing to its’ success. There can be any number of leaves (KR’s) coming from any branch, although best practice says you should have only 1 to 4 KRs (leaves) per Objective. There is no magic to the number of branches off of the trunk – it all depends on how complicated that area of your business is. Ultimately your goal is it to cover all areas to the same level of detail. A good proxy for detail may be level-of-effort. Some branches may have just one level of sub-branches, and others branches may have many more. 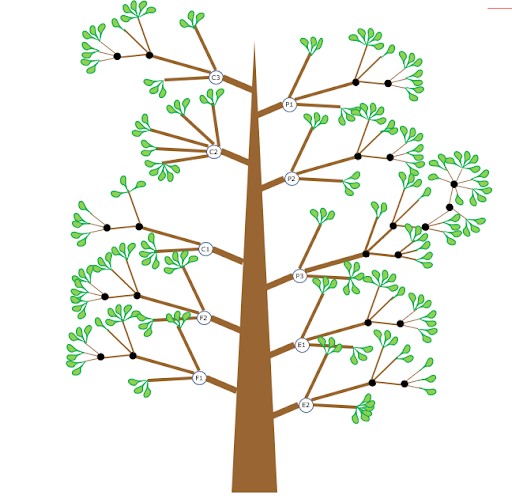 Your final tree (OKR structure) has a mix of branches and leaves. 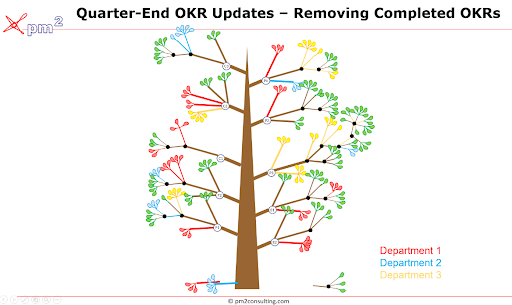 Now, the tree does not grow itself… it needs the guidance of that arborist (your OKR Sponsor/Coach/Consultant) and nurturing (contributions) from the entire organization. The tree is made up of ‘the sum of the parts,’ so every part is important. 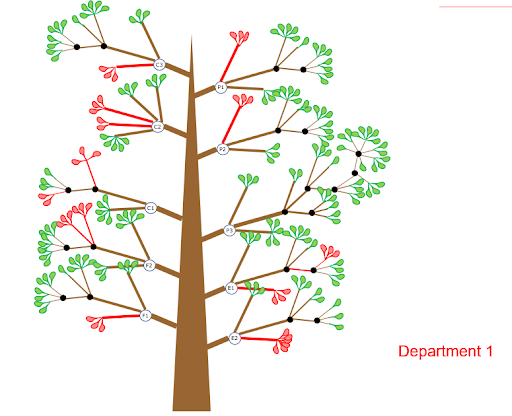 You could Visualize any branches related to a specific department to be a different color, say, red. 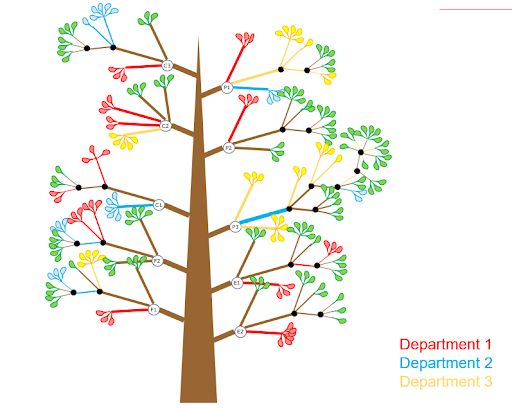 This view would allow you to see how that department contributes to the overall health of the tree (organizational success)… so you can make sure they are doing what the tree (organization) needs from them – and not contributing in areas where they are not needed! This coloring idea could also be used to assess different projects, teams, products, etc. There are no rules about what you can graft onto your OKR trees. 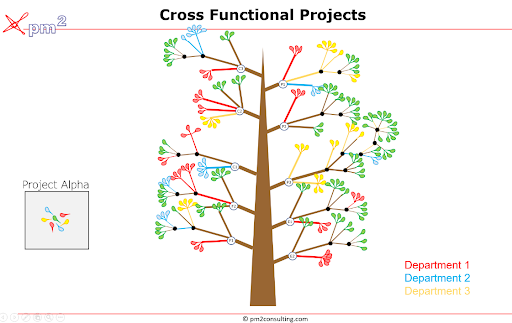 To keep the metaphor going, you can think of cross-functional projects/teams as a collection of leaves from the tree – the key results from various departments, teams and other projects. These leaves can be seen both on their branches and as part of the special project. Again – there are no rules on how you have to structure these elements. Just make sure it tells your story in a way that your organization understands! 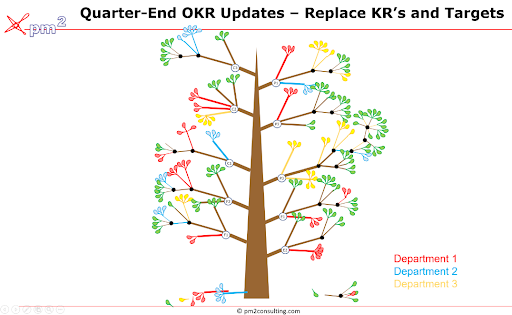 Periodically you’ll need to trim your tree (OKR framework). Organizations usually do this once a quarter. Objectives that have run their course – they have achieved their goal and are no longer of use to the organization. Think of that as trimming branches off the tree. In your quarter-end (or quarter-start) meeting your arborist will guide you in culling out the deadwood – the branches that are no longer contributing to the tree once they have completed their mandate. You will also be adding new branches (Objectives) onto the tree, representing new Objectives for the coming period. Likewise you may want to remove or replace some of the Key Results (leaves) to better describe next quarter’s performance requirements – and add new leaves onto your new branches (Objectives). 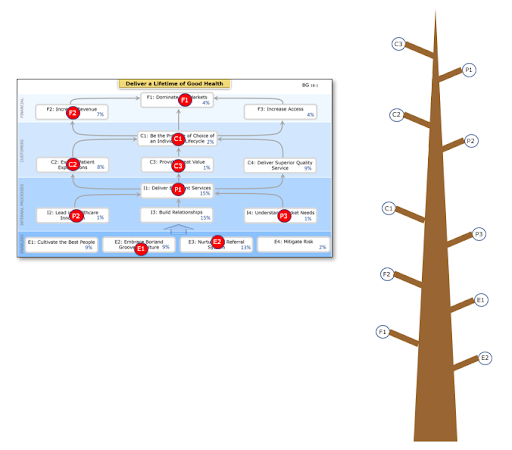 So, there you have it – the life and times of an OKR as seen through a tree. Like with any metaphor, this does not describe every possible OKR scenario – but it does give you some solid ideas to work on.